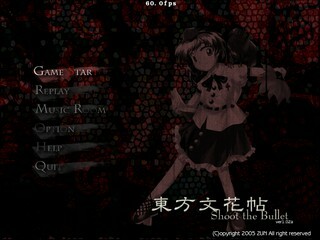 Released in 2005, Touhou Bunkachou ~ Shoot the Bullet is a shmup/puzzle hybrid for the PC. You play as Aya Shameimaru, a tabloid reporter, and in each stage you have to survive long enough to snap multiple pictures of the boss without getting hit. Your camera also cancels bullets but loses effectiveness the further away from the boss you are, so clearing all 85 stages is quite the challenge. I want to thank I have no name for taking the initiative and starting up this speedrunning project, I certainly wouldn't have been anywhere close to this good without the Double Spoiler experience from earlier either. I also want to thank SDA for having provided me with plenty of entertainment over the past years, keep up the quality! I've spent a long time working on this, even though not all of my levels saw direct competition I'm rather confident that these are pretty good times. Sure, they can all be improved, but getting off frame perfect shots while weaving through bullets is hard, and the fun part was always figuring out the routes for me. Zooming the camera like this before the very first photo might be a bad idea in a real time attack, but when competing against the in-game clock it's alright. This strategy saves over 2 seconds from a normal fast clear attempt. The time window for this execution is very tight. Abusing the fixed camera orientation in this game to get a further reach than staying below the boss. Also, note how a bullet passes cleanly through the center of the hitbox just before the third photo. This is possible because of the combined unfocused speed of Aya and the opposing bullet is enough to bypass the hitcheck. Or so I'm told. Same deal as in the previous scene, going to the side of the boss allows superior reach and the right side of the screen is preferable because you can't see the camera charge when up against the left side. The mist is harmless, thankfully. Letty moves around a lot, and makes it risky to stay inside the mist like on 2-2. Sometimes it's hard to know whether waiting for the next barrage is faster than just shooting when ready. I do a pretty bad job taking out the dolls here. Not that it matters as long as you get capped recharge. Keine's movements makes this just a little harder than just streaming. Tappity-tap. Another scene where waiting for more bullets is very tempting. The execution feels quite clean here. Very awkward scene to speedrun for me, I played it quite a bit and this was the best I managed. It's tricky to stay this close to Keine, but the lasers will snipe you when charging the camera otherwise. I get rather lucky with the bullet arrangement before the last photo. Medicine moves to quickly for me to feel comfortable going up to the side here. I decide to wait for the bullets to materialize here, it seemed like the best method for me after many attempts. I spent a ton of photos on this scene figuring out the route. My favourite stage 4 scene by far! This scene is awful to speedrun. The great variance in vertical movement and the poison mist makes it very RNG dependent. It's impossible to dodge certain bullet formations without breaking up the camera charging. You can't be kicked directly when going along the edges of the screen. Going up to the side of the screen is very risky and I couldn't make it work here. Unlucky with Meiling's vertical movements on the last photo, but otherwise good. I like the second shot, taking a photo without even raising the camera like a ninja. I spent quite a bit of time here, so I think it's pretty well optimized. Very RNG heavy and hard to speedrun for me. Last shot is delayed because I couldn't see the gauge. Static scene, everything happens according to plan. The speedrun of 5-7 took me over 900 photos in total in order to be faster by 0.04 seconds (91.18 seconds remaining) (note: the previous record of 91.14 seconds remaining wasn't submitted to SDA). Yes, this many, meaning I had lots of failed and successful attempts which weren't faster or even slower. Guess this is what you call "determination", haha. I enjoy seeing games beaten in record time, and I guess this is sort of my contribution to it, even though I only did one scene. This took me a ton of tries to get down, but it looks rather easy in the end. I wait for bullets to spawn here, seems like the best thing to do. This feels rather close to perfection. Retrying this scene when the screen is shaking causes the game to produce desynched replays. Made it rather annoying to reset when you make a bad first photo. So hard to make the call to wait for more bullets or go fast here. I tried a lot of different approaches here, especially with the second phase. The camera ultimately breaks this scene though, and it's rather straigthforward. One of the hardest scenes in the game to get a decent speedrun on. This strategy is very difficult and it doesn't help that you have to sit through all that stuff in the beginning before every attempt either. I aimed to get in the last photo before another timestop. The camera breaks this scene. For some reason getting off that last photo before the timestop took me 342 photos. I wonder if PETA would approve of Aya's camera. It might be possible to ahead of one cycle here, but unlike 1-4 this is somewhat hard to dodge. I tried for a clean clear without much camera zooming instead. This scene was made for speedrunning. This is the last scene I improved for this submission. I spent over 1000 photos creating this route. Slowly streaming the lasers isn't safe, the trailing butterflies can spawn on top of you. This looks very silly, but works unless Ran moves close to you, as the amulets are aimed around you. It's much easier to clear it normally though, as the RNG very easily screws you over when doing this method. The side of the screen is OP. At first I expected a defensive photo to be required here when I first started speedrunning this game, thankfully that could be avoided with this method. Probably one of the hardest scenes in the game to speedrun or scorerun. I make some very risky moves here, and it feels tough to improve this, even though it's quite far from optimized. Dodging the aimed barrage like this took me some time to learn, my total photo count was close to 2000. The margin for error might be within a pixels width, and it requires excellent timing, on top of that you can get walled by lasers if you are unlucky, and if Kaguya moves down too far on the screen you're probably screwed no matter what. Usually referred to as the hardest scene in the game, I spent 2861 photos speedrunning this. Staying high on the screen and not leaving the charge forces you to make quick readings and pull off very tight dodges. The camera utterly destroys this scene. This is a modified version of the strategy I used to do a 120fps clear of this scene. This scene feels rather tight. One of those scenes that drastically changes when you speedrun it. Spent 2636 photos speedrunning this. The third, sixth and seventh photo are very RNG dependent when speedrunning. This scene hates speedrunners. It's seems impossible to move away from the giant laser without breaking camera charge, and there's no micrododging at all, so charging gives you no real advantage in survival. This route seemed to yield rather good charge regain. I tried a lot of different approaches here, but optimizing this scene will be incredibly difficult. The second phase can easily screw you over and Aya is invulnerable to photo during the first second of firing the red butterfly barrage. Would be cool if it was possible to survive the third wave of lasers without using the camera. Static pattern, can be improved by anyone who is better than me at dodging, or more determined to memorize it completely. Very hard to optimize due to the randomness in boss movements, I'm okay with how this turned out though. Another scene which might be quite close to perfection. It's a quite fun game. What makes it interesting is that it has a really unique concept, namely taking photos of bosses while dodging the danmaku thrown at you. I suggest you try it out. Be aware that it's quite challenging, though.